Corporate Events, Airport Transfers or even the Office Party!! Whether you are looking to transport your clients or colleagues simply contact us and we can help manage the whole process for you. Our range of 16 - 57 seater coaches combined with our smart uniformed drivers and prompt service, ensures you can rely on us to cater for all your travel needs in both comfort and style. For total luxury, we recommend hiring our 49 seat executive coaches. These coaches come with the following as standard. 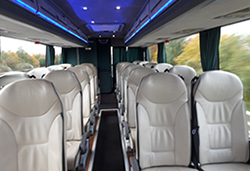 As well as providing you with coach hire and a fun day out of your choice, we can also arrange a hostess service to serve your staff/clients with tea and coffee or even morning breakfast. Whatever your requirements Cozys will be able to accommodate you. Contact us for more details. Our vehicle record is second to none, and all our drivers are fully DBS checked. All vehicles are maintained to the highest standard regardless of cost. We also have an excellent backup system in place in the unlikely event that a breakdown should occur. Cozys would like to ask you to please bear in mind when obtaining prices that we operate a modern fleet of coaches, all of which are fitted with the latest safety devices, including ABS (anti-lock braking systems), ASR (anti-slip restrictor), R66 (roll-over protection bars) and all are fully seatbelted. We appreciate that price is always going to be a factor in making your final choice, however it really shouldn't be the primary one. You may find that prices vary considerably, but we ask that you ensure you are comparing the entire proposition, not just the price when making your enquiries and comparisons between us and other suppliers. We are always very happy to quote a price for coach hire, whatever the purpose. Please selected Online Quotation at the top of the page to enable us to provide a quotation. please include as much information as you possibly can. Alternatively, contact us by telephone to discuss your requirements.